Well… I have taken on the challenge of blogging everyday during the school year. Now that I am at UNBC in Prince George,… living away from my family… this would be an excellent time to reflect on my learning and experiences. Thank you Ian Landy (@technolandy) for inspiring me to do so. I always thought you were CRAZY blogging everyday, but you were inspired by George Couros (@gcouros). I like the idea that one is learning from another. I also appreciate the notion of you don’t know what you don’t know unless you try. So… here we go!!! Of course, I have started this daily blog challenge one day behind. Yes, it will be a 2-blog day. I could have started with DAY 1 today but I was thinking about this blog entry before writing about DAY 1 – “Back to School.” I’ll get to that blog entry after I get this one done. First of all, I love this photo. 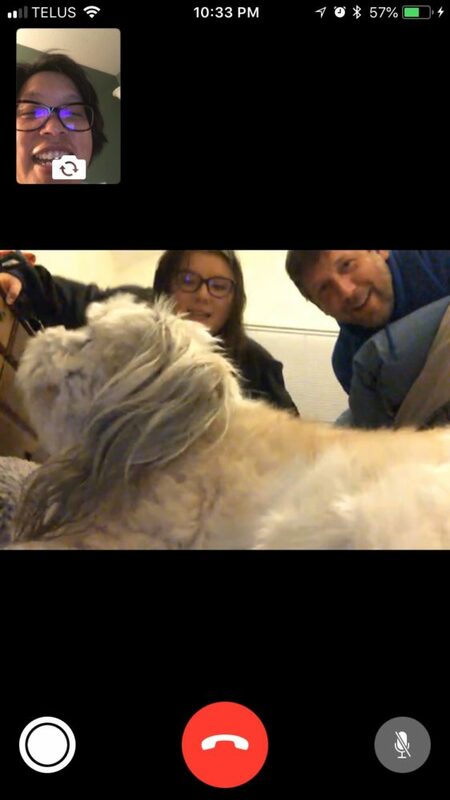 A snapshot of my little family on FaceTime. It’s also how we are going to spend our time together. It’s true… my little family stayed in Sechelt on the Sunshine Coast and I ventured alone to Prince George to start a full-time teaching appointment at the UNBC School of Education as Lecturer. I’m pretty excited about this opportunity and the teaching/learning experiences I can be a part of. Admittedly, I’m pretty stoked. It’s a nice match to my expertise and research background. I am super happy to stay close to the K-12 system, teach pre-service teachers, and do research at my own pace. It’s nice. One thing about EMBRACING CHANGE that I am not a personal fan of… and continue to struggle with… are the people who will come and go in your life. When I was younger, classmates would come and go. I was very accepting of that idea. As an adult and building relationships with those in your workplace, for instance, I am perplexed how some friendships are broken or temporarily set aside, while others stay unscathed and stronger than ever. At some some level, it’s really out of my control and yet on another level, I wished that things would always stay the same. This is a naive point of view. Of course if I am changing and making changes, the people in my life will change. The only way I can accept this phenomenon exists is that to allow new people in my life, others have to go. It’s not like I choose this. Well… I may sometimes, but rarely. This belief helps me through the hurt and unknown reasons why people are no longer in my life. I look forward to those who will enter my life while in Prince George. I have met so many great people and it so awesome to be reunited with former students, friends from the past, and members of my Twitter PLN face-to-face. Lots have people have entered in my life in addition to meeting really nice people in the community and UNBC School of Education. It is an excellent exercise of making myself vulnerable and open to meeting new people, but also let go of those who no longer want to or need to stay in my life. This phenomenon has happened several times during the last 24 years since I left university during my undergraduate years. It’s something I am noticing and mindful of. In the end, I will EMBRACE CHANGE but in doing so, the people in my life will also change.